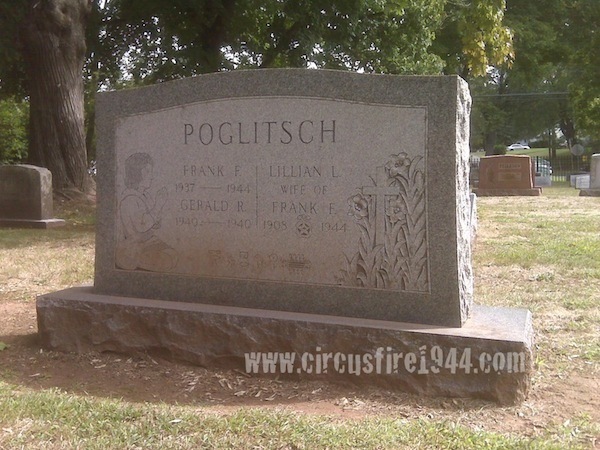 Frank Ferdinand Poglitsch, Jr., age 6, of 311 Shuttle Meadow Avenue, New Britain, was born December 29, 1937 in Philadelphia, son of Lillian (Roth) and Dr. Frank Poglitsch. Frank Jr. was found seriously injured at the circus grounds after the fire on July 6, and was admitted to Municipal Hospital where, despite supportive treatment, he died after 2am on July 10. He was buried at Fairview Cemetery in New Britain after services at the A.W. Carlson Funeral Home. Frank leaves his father, and no siblings. His mother Lillian was also a victim of the circus fire, and he lost an infant brother Gerald four years earlier. The estate of Frank Poglitsch, Jr. was awarded $6,500 by the arbitration board.